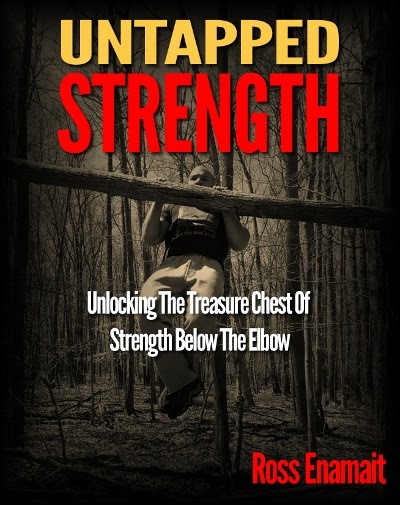 Untapped Strength is a 244 page e-book that is dedicated to lower arm development. This program is not intended for grip competitors, but rather athletes and exercise enthusiasts who wish to develop the lower arms to enhance performance and improve overall strength. Throughout the book, I detail a simplified approach to lower arm training that is intended to complement your existing routine. Regardless of your athletic goals, stronger hands, fingers, and wrists will enhance performance and reduce risk of injury. As a martial artist, grip strength is pretty important overall. Afterall, a strong grip allows you to retain your tool, be it a knife, sword, stick, staff, etc. A strong grip allows one to grip the clothing of an opponent which can be the beginning of a choke or a throw. Need I go further? I'm going to be ordering this book and look to improve my lower arms and grip with Ross Enamait's help. Do you already have the book? If so, please leave me a comment below with your review. I thank you in advance.